Rising’s California Utilization Review doesn’t just comply with state regulations, it exceeds expectations. All California employers or their workers’ compensation claims administrators are required by law to have a utilization review program. Governed under Labor Code section 4610 and the California Division of Workers’ Compensation (DWC), the utilization review regulations provide guidelines for reviewing the medical necessity of treatment plans and timeframes for decision making. Additionally, at least once every three years, entities conducting utilization reviews for California claims are subject to a routine audit by the DWC to ensure regulatory requirements are being met. Further audits may also be conducted if there are suspected violations and administrative penalties can be assessed for non-compliance. 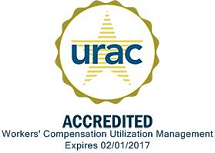 As a Utilization Review Organization (URO), Rising’s California utilization review (UR) program provides employers and claims administrators with UR services that meet state guidelines. In addition to our California UR solution, Rising provides an entire suite of medical cost reduction and care optimization services.